We started Long Island cheese pumpkins (in the photos) from seed this year and planted them over at my father-in-law's big garden. We were over there last weekend and checked on them and saw that we have a lot of pumpkins. A few were ripe so we grabbed a couple. The first thing I noticed is how adorable they are and what a lovely shade of orange they are on the outside. I roasted one up right away and froze a bunch of puree (and have a feeling I'll be doing more of that). I'm excited to give these pumpkins a try in pumpkin pie because they have a sweet, dense, bright orange flesh and according to some of my research they were historically a preferred pie pumpkin. Since we have a lot of pumpkins on our plants, you can probably expect even more pumpkin recipes this fall/winter! 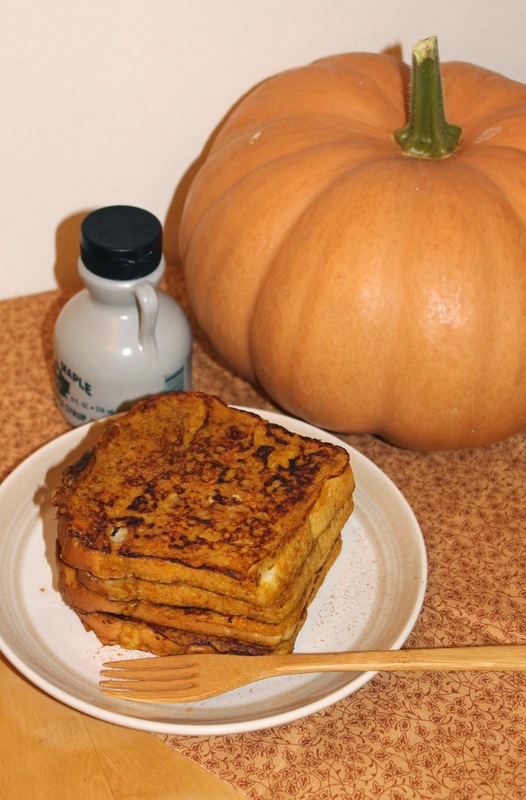 One of my favorite fall weekend breakfasts is this French toast. The custard is full of pumpkin puree and pumpkin pie spices. It's delicious, especially with an extra sprinkle of cinnamon, a good drizzle of real maple syrup, and some sage breakfast sausage. This recipe will make about 8 slices of French toast. Now as most of you know, we live just outside of the City of Buffalo. Around here, people take their chicken wings and hot sauce very seriously and we don't use the word "Buffalo" in front of foods.... However, when I'm making a recipe for a wider audience that uses the flavors of Buffalo, I think it's appropriate. 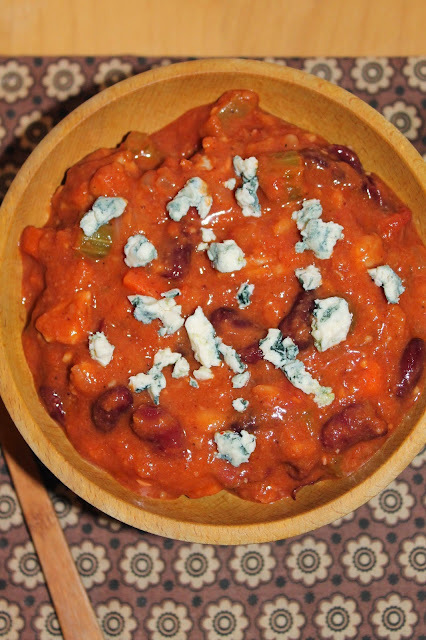 This chili combines chicken, celery, carrots, hot sauce, and blue cheese (all the flavors of chicken wings) in a chili base of tomatoes, spices, onion, and beans. We were a little unsure if we would really like it when I was first thinking about it, but we ended up loving it! The flavors combined so nicely and the spice and heat levels were perfect for us. This chili is a great choice for a game day afternoon or for dinner any cool evening. 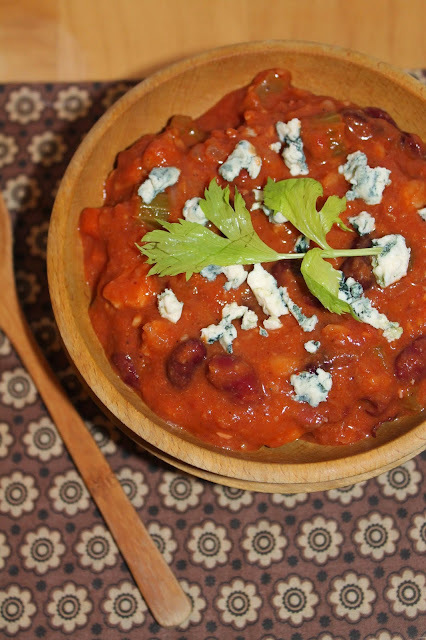 I highly recommend an icy cold beer to go along with it because this chili will definitely warm you up! This recipe will make about four servings. I don't say this lightly, but this curry is one of my favorite meals I've eaten in a while (and my husband concurs). My husband found this recipe in his magazine The Week and it comes from a book (which I've now requested from the library and can't wait to read) called Apples of Uncommon Character: Heirlooms, Modern Classics, and Little Known Wonders. Long-time readers know that I love apples and that we go apple picking every fall (it's coming up soon). It's just something that you have to do in apple country during the fall. We go to this great orchard at Lynoaken Farms where they have tons of heirloom and heritage apples so we try all sorts of different varieties that you'd never find in a grocery store. I'm hoping that the library gets the book in before October so I can read it in time. I urge you to make this curry this fall. I used the original recipe as a guide, but made many changes for my final recipe. 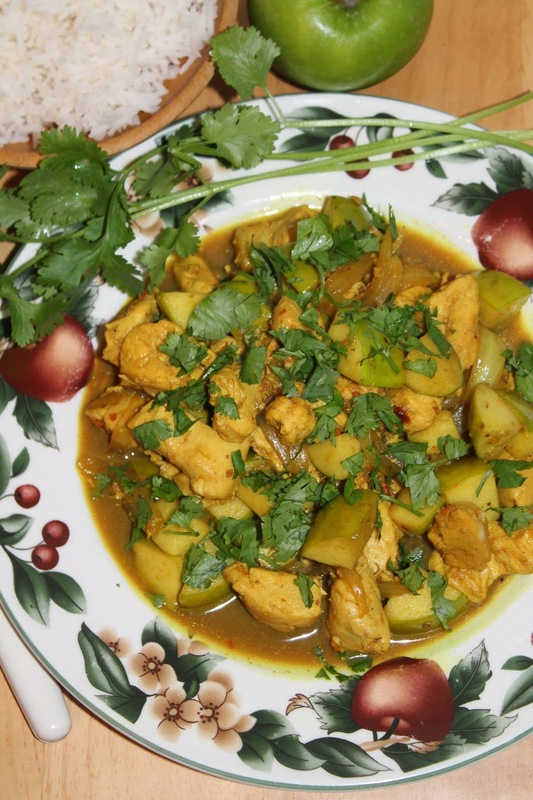 I used Granny Smith apples because I thought the tartness would be nice in the curry. I think one sour and one sweet apple would apple would also be nice. The apples pair so wonderfully with the Indian spices. My version will make about three to four servings. Serve this curry with Basmati rice and a dollop of plain yogurt on top. Behold, my first pumpkin recipe of the season! I couldn't wait any longer! Over the weekend I decided it was high time to kick off pumpkin season with this pumpkin spice loaf cake. 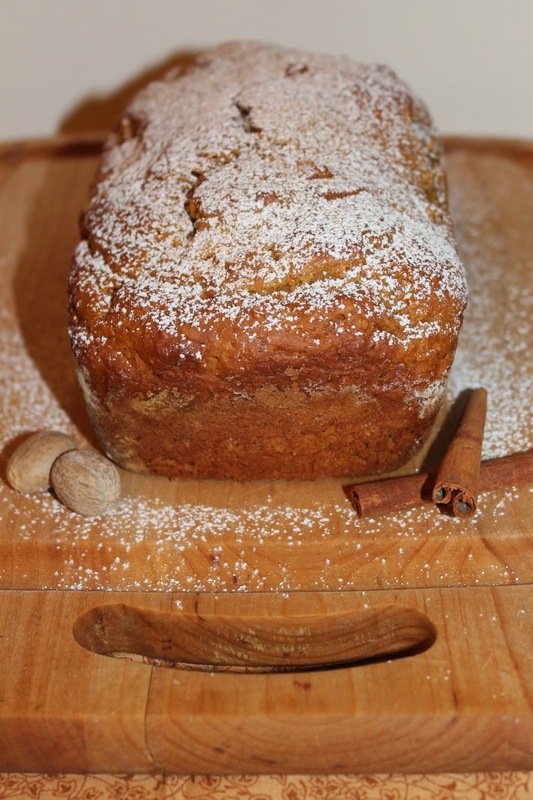 This loaf is pretty simple to make and while I usually love to toss in nuts and/or chocolate chips when I make pumpkin baked goods, I wanted this to be all about the pumpkin and pumpkin spices that we all crave in the fall. While baking, the whole place smelled of warm pumpkin spice, which was perfect for a crisp day. This is a lovely treat for after a day outside or with a hot cup of tea for an autumn weekend snack. This recipe will make one 9 x 5-inch loaf. Most quick breads/loaf cakes have at least one cup of sugar in them, but I almost always cut down the sugar. Feel free to add more for a sweeter cake. I dusted it with powdered sugar only to make it look prettier for the photo - that's completely optional. A glaze would also be nice, or a smear of pumpkin butter on individual slices would be even better. Have you made your first pumpkin recipe of the season yet?? Soup and chili season is arriving! I absolutely love making and eating a hot and hearty soup when the weather is crisp and cool. My husband and I took a walk at the nearby park yesterday evening and noticed that the leaves are starting to fall and that they were crunching under our feet. The squirrels were packing away acorns, crane flies were hovering over the grass, and the smell of fall was in the air (although it's still a bit warm). It's my favorite time of the year. We had a ton of jalapenos that needed to be used up and I found this recipe is from Cinnamon, Spice & Everything Nice. I adapted it as written below. 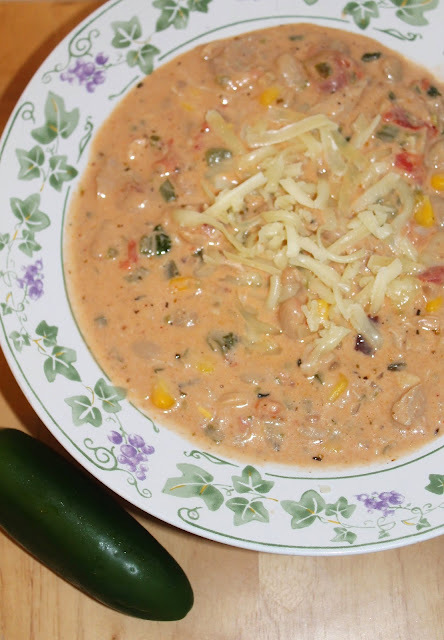 This soup packs a punch of heat from all the jalapenos, but the creaminess mellows it out making a smooth flavor combination. This recipe will serve about four people and the leftovers are even better. This pie was my husband's birthday dessert pick for this year. I had been wanting to try a honey walnut pie based off of my maple pecan pie for a while now, so this was the perfect reason to give it a try. I modified the recipe just slightly and it turned out super yummy. If you are lucky enough to have access to (and the patience for) collecting and preparing black walnuts, they are in season right now. I cheated and bought walnuts from the store, but I did use local honey. 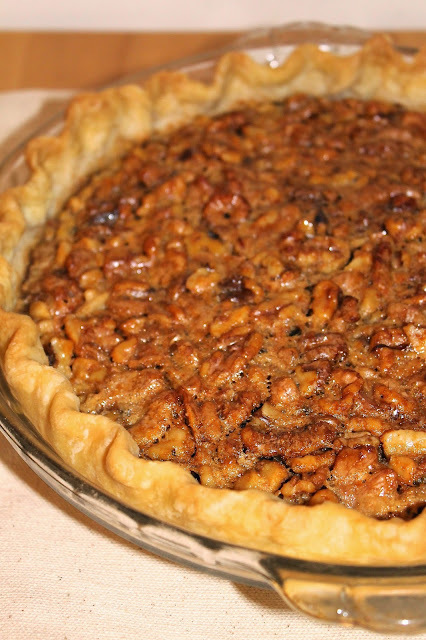 The pie turned out really delicious - similar to a pecan pie, but with a different flavor. It's really sweet from the honey, so a little piece goes a long way. This pie would be a very nice addition to your Thanksgiving table this year, or for any fall meal. I've been posting less frequently lately - it's been a somewhat difficult few months for me. It's not something I want to go into details about, but it's been both physically and emotionally challenging so I haven't been cooking as much lately as I would like. I'm hoping to get back into the swing of things soon.